If you want to get best Kids tennis Racket there is something good in this article,”First we make our habits, and then our habits make us.” Great Habits take us a long joyful way so as a parent why not cultivate the seeds of great habits in our offsprings from a tender age. Indulging kids into sports from a young age is both beneficial for their health as well in deciding up their profession to so extent. Nowadays Tennis is getting quite popular with the young generation.Once your child shows up the interest for the sports of tennis, the next thing to do is to get him the right Tennis racquet. Buying the tennis sports equipment can cost the parents al, so it is advisable to start off with something readily available, and not much expensive the old racquet is the perfect for your young one to find out whether your child is a tennis lover or not. Head Size: 115 sq. in. / 742 sq. cm. 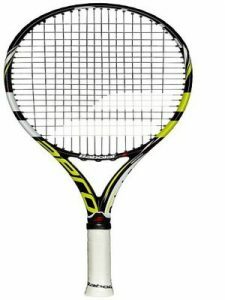 The two foremost important factors in selecting the young tennis racquets are the racquet‘s length and the child’s height usually the children falling under the age group 4 years or younger with 40″ or short height go for 19″ long racquet and the oldest children with 55″ or taller uses 26″ long racquets. Grip Size-The standard grip size for Kids tennis Racket is 4″. Head heavy or Head light. Open or dense string pattern. As compared to the junior lawn tennis racquets of the gone old days their modern high-tech counterparts are more sophisticated regarding the structure and performance. 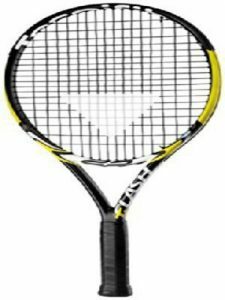 The classic example to discuss in this regard is the Babolat’s junior version of AeroPro drive kids 26 tennis racquet.The key features of this kids racquet are its outstanding power, spin, and it’s beautiful, fast strokes, this racquet is for those young players who want to have ultimate command over the power and create spellbound shots. The junior –sized variant of Rafael Nadal‘s Babolat AeroPro Drive GT has its graphics upgraded for 2013 model. This superb racquet resembles entirely regarding design and fabrication with the Nadal‘s inspired Babolat’s adult version of AeroPro drive racquet. 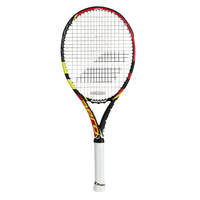 The kids Babolat AeroPro drive 26 racquets have all the great traits of its great predecessor with one newly added quality that is this racquet comes with a high-powered cortex system to generate more comfort and tactility. The head of this racquet is the combination of braided carbon fibers and tungsten filaments that provide solid rock like support to the frame and at the same time minimizes torque for efficient precision. 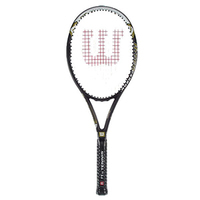 This racquet has three kinds of dampeners to suit the individual style of each young player. The overall maneuverability provided by this kid’s friendly racquet is marvelous. The racquet with its superb touch and control leashes out great volleys and not forgetting the stunning groundstrokes born out of these racquets as the end product of the head speed that is generated by this junior Babolat product, the aerodynamic feature of this junior equipment leads to the creation of genius fast strokes. 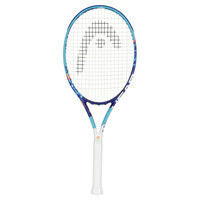 This racquet is an ideal gift for those kids who want to make their baseline strong. This kids equipment comes with a head size of 100 squares inches which is not bad to play with for bigger the racquet head, the more power its generates and also provides a larger sweet spot which makes it a bit easier for the little hands to hit the ball around the middle area of the racquet.The stiffness of any racquet is directly connected with the power and the comfort, bending of the racquet frame on touching the ball snatches away all the energy of the ball having an adverse impact on the shot’s power. Thus the structure needs to be stiffer to avoid the unnecessary deflection. The manufacturers of the Babolat brand have overcome this problem by providing racquet having stiffness around 69. Available in the grip sizes of 4″ and 4 1/8″. Combined of 100% high modulus graphite. 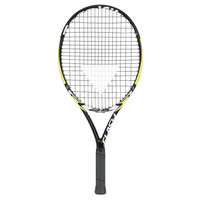 The racquet is pre-strung with black synthetic gut. Active woofer system that leads to the interaction between strings and frame provides 25% long ball –strings interaction.This tennis racquet falls under the fifth generation of the Aero Pro brand and comes with an impressive power as well to top spin. The material that goes into the making of this junior version of Nadal’s super racquet is aluminum is available on the market in the pattern of the 16×19 string bed. This open string format comes with great flexibility which allows for the provision of more spin and power when touching the ball comes with the strung weight of 9.2 oz.One of its other characteristics is that it exhibits No shared Holes.String tension amounts around 55-65 pounds. The makers of the Head brand makes racquet for kids of different age groups as well covers various stages of kids tennis players whether it be a beginner or expertise the company has something to offer to every player. 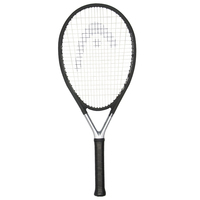 This racquet is best for children falling under the age group of 9 to 11.This power packed racquet exhibits the similar extraordinary Graphene XT technique that its adult version does enable the young tennis players to experience the same power, spin as well controls that the adult users feels when they use the adult model of this racquet. This racquet is for all the young players who look up to Maria Sharapova and Tomas Berdych both are the ace players of the tennis world as well the brand ambassadors for the adult head Graphene XT Instinct racquet. 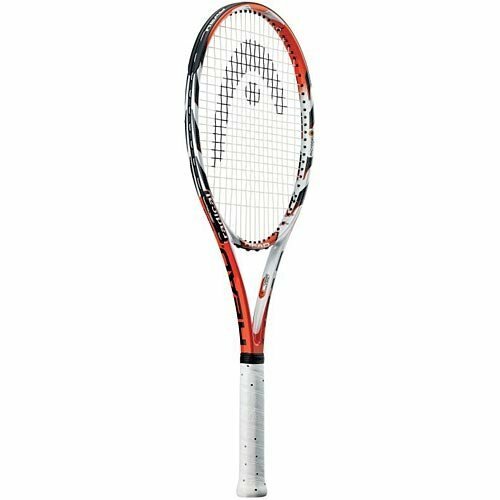 The selling feature of this kids head racquet is its Graphene XT technology that is responsible for its light weight, not only this but also leads to the robust structure of the racquet. This feather-like weight of the equipment makes it kids friendly no matter what age the user is he can easily make the racquet dance to his tunes; the young player can smoothly manage the different position of the racquet at the lawn tennis court and this light racquet effortlessly triggers the stroke speed required for the effectual spin. The Graphene XT technique emphasis more on higher racquet head speed as well on rotational racquets movements for the extra power and spin. This technique had ideally shifted the weight more towards the tip and the handle for greater even distribution which mounts to smoother acceleration and ultimate power and increased stability. The maneuverability offered by this racquet is surprisingly good not letting down the junior hitters. The racquet comes with an open string pattern of 16×19 contrary to the closed string format; the former provides for extra power and spin because of its flexibility when lashing out at the lawn tennis ball in addition to the smooth feel that this open string pattern yield is mind blowing. The recoil feature of this product provides for cross-linking abilities to maintain a stable frame while delivery the faster swings. Tecnifibre Company had its roots back in France. The brand was the brainchild of Thierry Maissant, the current CEO of the enterprise. It was founded in the year of 1979.This company specializes in sports goods mainly related with Tennis and squash. Every year this company produces tons of sports goods such as racquets, bags, strings and other accessories.As the time passes by Tecnifibre became quite popular in the field of the strings manufacturing, especially in multifilament, applying the outstanding technology namely “PU400 inside”.There are three different kinds of lawn tennis racquets available in the market under this brand name such as T-Fight, T-Flash, and T-Rebound.As it is evident from the name TFlash 25 junior tennis racquet belongs to the TFlash category of the tecnifibre brand and has been designed for the kids falling under the age group of 9 or above. 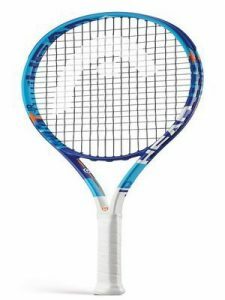 This racquet is an ideal companion for the starters who are keen on polishing up their skills and are ambitious enough to become an ace tennis player. The primary material that goes into the making of the structure of this tennis is graphite. The use of graphite keeps this racquet lightweight and stiff to add on to the performance level and also overall stability; this graphite makes the racquet durable. The high-tech feel of these tecnifibre junior racquets attracts most of the kids who are after high packed power and maneuverability. The head size of any racquet is a major deciding factor in the selection of any good quality lawn tennis racquet. A head size that is relatively large yields extra power and provides quite a large sweet spot, this is the place where the lawn tennis ball should touch maximum times for the excellent outputs. The TFlash racquet has got the head size of 102 square inches that is distinguished by mid-plus head size yielding maximum power without giving up on control to motivate the young players to go for that extra pace.After the head size, the length of the racquet matters a lot especially if it is a racquet for the little champions, as far as this junior racquet is concerned it comes in the length of 25″ which is very handy for the young hands.This racquet comes with the string pattern of 16×18 which falls under the category of open string format and fuels up the power and spin. This TFlash racquet is pre-strung and strung with synthetic gut string. The beam width is 24mm. Those long wooden hard sticks that our grandparents used as the tennis racquets is the thing of the past. The wooden sticks replaced by the sophisticated racquets having frames made of graphite and carbon fibers these materials encourages more aerodynamic shapes for the extraordinary speed in which the frame head can cut through the air and give the player the opportunity to experience more power and super control without compromising on the stability.There is for sure no dearth of quality loaded racquets out there in the sports goods stores, but the thing to keep in mind while opting for any racquet is to look for the ones that match up to the individual needs of the player for there are different racquets for different game styles.Thankfully, the technology had created best tennis racquets which are high on performance based level. IN today’s world time is money so to save your precious time without letting you lose your energy we have discussed the premier junior racquets offered by different sports brands. The most famous names are Babolat, Head, Tecnifibre to name a few these manufacturers have manufactured fascinating kids tennis rackets, just need to go through this convenient piece of article. Head Size: 112 square inches.